We have begun our journey through Great Lent, and in a few short weeks, this will culminate with the services of Holy Week, itself a journey that culminates in the celebration of the Resurrection of Christ. On Wednesday of that week, we have the opportunity to receive the sacrament of Holy Unction, a service of prayers for healing, which is founded on James 5:14-16: "Are any among you sick? They should call for the leaders of the church and have them pray over them, anointing them with oil in the name of the Lord. The prayer of faith will save the sick, and the Lord will raise them up; and anyone who has committed sins will be forgiven"
While Holy Unction is available at any time of the year, its position in Holy Week is significant. Bridegroom Matins calls for vigilance as we approach the passion of Christ, that we not be found sleeping, as we prepare for the Resurrection. Like the wise virgins, will our lamps be trimmed with oil, ready to meet the Bridegroom at the wedding feast? After these services comes Holy Unction, which shows this sacrament to be an integral part of our preparation to receive Christ. Purchase Lynette's Hope online by Fr. Luke Veronis today! For today’s reflection, I want to use the model of one person’s experience of seeking healing—Lynette Hoppe. Some of you may remember Lynette, when she and her husband Nathan attended St. Mary’s while they were at Holy Cross, preparing for service in Albania with the Orthodox Christian Mission Center. My husband and I were co-missionaries with them for four years, and after our first two years there, Lynette was diagnosed with stage 4 breast cancer. Twenty months later, she fell asleep in the Lord, but her journal during that time records how she confronted death, prayed for healing and trusted in God’s mercy. I want to share some quotes from her journal—which are in the book Lynette’s Hope (ed. Fr. Luke Veronis, Conciliar Press)—within the context of Holy Unction. I think they can help us all to reflect and prepare for this sacrament. She tells of a recurring daydream that expresses her experience vividly: “I would walk out on a narrow stone bridge that spans a chasm and suddenly find that the bridge has vanished. Although I don’t fall, I’m left suspended with no support and no ability to move to safety. As I begin to panic, I hear a voice saying, ‘Look up.’ I look up and see a silvery rope coming down through the darkness. I grab on and am pulled to safety.” This is the way we also should approach Holy Unction, with total reliance on Christ’s saving power, reaching out for that “rope” of grace. In Scripture and the Church’s teachings, the healing of soul is always included alongside the healing of the body. We see this in the James 5 passage, and also in today’s Gospel, when Christ first tells the paralytic, “your sins are forgiven” and after “take up your mat.” The second prayer of Holy Unction asks, “O merciful Master…take up Your abode in these, Your servants, who acknowledge their iniquities, and draw near to You in faith…forgiving them...and cleanse them from every sin…” This reality became apparent to Lynette as she prayed the Akathist to St. Nektarios. “Throughout my illness,” she writes,” I haven’t thought enough about spiritual healing. Being a missionary, I suppose, made me feel that I ought to be a pillar of spiritual strength." She continues, however, that she sees that the prayers of the Akathist are just as much about healing of the soul, and she reflects on Christ’s ministry of healing: “The sick sought physical healing, but Jesus gave them the healing they really needed—spiritual healing.” As Lynette started to focus on the healing of her soul, it bore much fruit. She writes, “I see so much healing occurring in my soul—things that are too private to write about. Areas in my life that I didn’t even suspect needed healing, have been touched at a depth that makes me gasp with wonder. I had no idea of my own need, nor of the gift of healing that lay before my very eyes, just waiting to be grasped. Whatever may lie ahead, I embrace it with thankfulness, for I have been so deeply blessed and touched.” In the same way, our expectations from Holy Unction should be directed toward our spiritual needs as much as any physical need, and we should not let a state of physical health blind us to our soul’s need for healing. This spiritual healing is the very essence of our journey through Lent. As Lynette envisioned the Kingdom of God and began to sense its reality and imminence in her life, someone wrote to her about the “borderland” she occupied, which prompted this reflection: “It struck me that even if I were to get well, I would want to live all of my life in that borderland—that place where one has sight of the great City of God and yet remains with a foot on earth. . . It would remind me that I am an exile and pilgrim here. My true home is in that Great City with God, and I must spend my life journeying to that city, doing all the good that I can along the way.” (133). If we walk away from the sacrament of Holy Unction without this transformation—to go forth and serve, to live more intentionally in the presence of the Divine—we have not received the blessing that was intended. The healing power of Holy Unction, therefore, gives us a taste of the Divine Kingdom to come. In his book Great Week and Pascha, Fr. 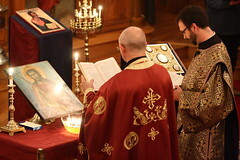 Calivas writes, “The purpose of the sacrament is to allow the person to share in the victory of Christ and to raise him into the realm of God’s Kingdom… where suffering, corruption and death are overcome.” In the sacrament, the liturgist prays “that this Oil will be blessed by the descent, power, and operation of the Holy Spirit.” The oil of Holy Unction empowered by the Holy Spirit heals not only the individual, but all of creation.